WASHINGTON -- With an August deadline looming, the House voted Tuesday to temporarily patch over a multibillion-dollar pothole in federal highway and transit programs while ducking the issue of how to put them on a sound financial footing for the long term. The most obvious solution would be to raise the federal 18. 4 cents a gallon gasoline and 24.4 cents a gallon diesel tax, which haven't been increased in over 20 years. But lawmakers are reluctant to raise taxes in an election year - especially Republicans for whom a vote in favor of any tax increase could trigger a backlash from their party's base. As a result, Congress has had to look elsewhere for transportation money while not increasing the federal deficit. The bill by Ways and Means Committee Chairman Dave Camp, R-Mich., relies on tax changes that are forecast to generate revenue over 10 years, but provide only enough money to keep the highway and transit programs going for another 10 months. The largest chunk of the money, $6.4 billion, results from allowing employers to defer payments to their employee pension plans. Funding pension plans normally results in a tax savings for companies, and deferring those payments means they will pay more in taxes and increase federal revenue. But several lawmakers suggested the revenue from the pension changes is illusory. "Come on, really, it's pretty phony stuff," said Rep. Peter DeFazio, D-Ore. "Let's get real about how we're going to fund our transportation" programs. House Speaker John Boehner, R-Ohio, defended the bill while acknowledging its limits. "Listen, these are difficult decisions in difficult times in an election year," he said. "The long-term problem is still there and needs to be addressed." President Obama, during a visit to a transportation research center in Virginia Tuesday, promised to sign the bill but said lawmakers should spend their time making long-term investments in the nation's infrastructure. "All this does is set us up for the same crisis a few months from now. So Congress shouldn't pat itself on the back for averting disaster for a few months," he said. Still, he implored Republicans to "just do something" to avert a crisis. Mr. Obama would like to see Republicans take up his $302 billion plan to increase transportation spending and keep programs going for another four years. The plan, which was paid for by closing business tax loopholes, was received coolly by Republicans. Democrats and some Republicans complained that it won't be any easier under the GOP bill to reach a compromise on sustainable, long-term means to pay for programs by pushing off a decision until next year when the presidential campaign is heating up. Republicans, however, may be in a better position to shape a transportation bill to their liking next year if they re-take control of the Senate in this fall's midterm elections. And the president's backing of the House bill will increase pressure on the Democratic-led Senate to pass it quickly, even though Senate Finance Committee Chairman Ron Wyden, D-Ore., has a competing bill that relies more on improved tax compliance to fund transportation projects. 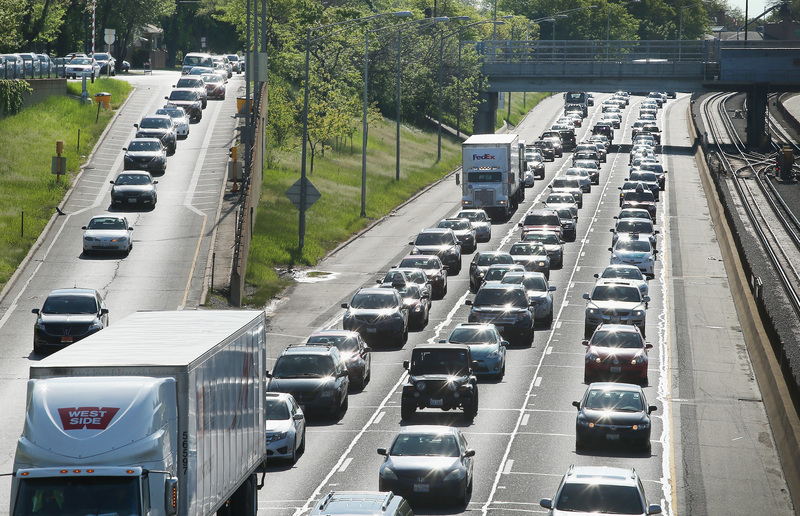 Republicans are divided over transportation policy. A significant minority of the party's more conservative House members want to slash federal gas and diesel taxes, dramatically scale back transportation aid and leave it to states to come up with the money to pay for roads, bridges, buses and trains. Two outside conservative groups who have the ear of tea party Republicans, the Club for Growth and Heritage Action for America, urged lawmakers to vote "no" on the bill and hold out for long-term reforms to the transportation system. But even the threat of poor ratings from the groups only motivated a few dozen Republicans to vote against the measure. Democrats say greater federal spending is needed to repair and replace the nation's aging infrastructure, meet the needs of a growing population and keep pace with other nations like China which are spending a greater share of their economies on transportation than the U.S. But they, too, lined up behind the measure and all but 10 voted to send it to the Senate. States have been told to expect an average 28 percent reduction in aid if Congress doesn't act. The fund is expected to reach a zero balance by the end of August. Some states already have begun to delay or cancel construction projects due to the uncertainty of federal money. The House defeated along party lines a motion by Rep. Earl Blumenauer, D-Ore., that would reduce the money in the bill to about $8 billion - just enough to pay for highway and transit aid through Dec. 31 - in the hope that another quick deadline would force Congress to come to an agreement on a long-term funding plan this year.